Do you like films? Do you like video games? 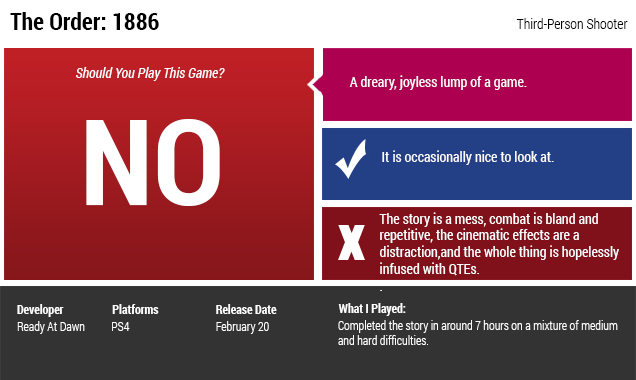 If you answered "yes" to either of those questions, you should probably skip The Order: 1886. The PlayStation 4's newest action game is a dull and lumbering thing. It's a brief, drab adventure starring a group of characters who all seem to dislike their lives and one another, and if it managed a single new gameplay idea over the course of its runtime, I didn't catch it. The Order: 1886 is one of the most depressing games I've played in a while. In fact, let's just get this out of the way. Should you play The Order: 1886? The Order is a third-person shooter somewhat like Gears of War, if Gears of War had been a bad game instead of a good one. It takes place in an alt-history 19th century steampunk London, where the Knights of the Round Table still exist as the Queen's elite operatives. Since the middle ages, the – known as The Order – have been using magical means to give themselves unnaturally long life, and have been locked in conflict with werewolves and other supernatural beasts. Lately, however, the Order's time and talents have been spent battling an armed human resistance that has cropped up in London and around the globe. That's… not a terrible setup, you know? It's the game's one idea, insofar as it seems like an idea that someone actually had, and not a thing someone saw in another game and decided to copy. It's wasted, of course, but it is at the very least a moderately novel setup in our current video-game age of zombie infestations and near-future warfare. You play as Sir Galahad, a big mean moustache who stomps around yelling at everyone. "Damn it, I'm in no mood to jest!" he yells at one point. It's true; he's not. Early in the story, Galahad discovers a dark conspiracy that could go… all the way… to the top! The script never shies away from a good cliché: for example, two characters separately inform Galahad that, in truth, they and Galahad are not so different. The story itself is slight, rushed, and feels as though it was cobbled together from the shambles of a larger, grander tale. Its twists and turns are never surprising, and the script doesn't lay enough groundwork or develop its characters to the point where any of the plot developments feel consequential. The Order is a barely competent third-person shooter. It repackages the cover-based shootouts of Gears of War and Uncharted without managing to capture any of the artificial intelligence quirks and level design tricks that made those games so reactive and exciting. When it comes time to shoot people, you're pushed into a small arena with next to no space for lateral movement. You'll crouch behind cover. Then, you'll simply pop up and take down target-dummy enemies as they lean into view. Gunfights are interminable and nearly indistinguishable. There are a mere handful of enemy types. One of them, a "shotgun specialist" who charges your position and can knock you back out of cover, is annoying. The rest are simply unremarkable. Their affiliations often change, but they remain functionally identical. Rebels, Queen's soldiers, hired guards — Galahad murders them all. Hey, it's some guys, wearing grey, holding guns. Kill them. There just isn't any give to the game, no room for flexibility or improvisation. You enter the room from this side, the bad guys funnel in from that side. You're usually locked down behind one piece of cover. There's often a second piece of cover further up, or to your right or left. You can shoot guys from here, or from just over there. You can throw a grenade. Those are your only two viable options — melee attacks are awful, and each arena allows for minimal flanking or positional strategy. Your teammates will occasionally yell things like "I'm being suppressed!" but there's no mechanic behind it, and no way to give your team orders or change up how you approach a firefight. It's a shooting gallery, plain and simple. Galahad's arsenal has been designed by Nikola Tesla himself, and by all rights should've been a bright point. Instead, The Order's guns are yet another disappointment. You'll spend the majority of the game wielding the same machine guns, sniper rifles, pistols, and shotguns that you've used in countless other shooting games. The two exceptions — a cool napalm + firebomb launcher and a deadly lightning gun — only turn up a couple of times each and carry some harsh ammo restrictions, and there's no way to customise your loadout before heading into the field. Levels are linear and restrictive. The Order's sole open-ended environment is used for a brief stealth section midway through the story. You creep through a garden in the dark, timing button-presses to kill guards as you sneak up behind them. It's difficult to tell who can see you and who can't. If you're spotted, you're instantly killed and must start over. It's as fun as it sounds. Right about now, you're probably thinking back to what I said about how the Knights have been locked in conflict with werewolves and other unnatural beasts. What about that? Wasn't this supposed to be a horror game or something? Well, no. Turns out, The Order is a man-shoot to its core, and it contains almost zero meaningful encounters with monsters or the supernatural. At a couple of points, you'll find yourself in some dark (very dark) warehouse or other, where you'll have to kill a couple of werewolves before you can proceed. They'll charge straight at you, and you'll have to shoot them a load of times. If you don't, they'll knock you over. Which brings me to the other primary means by which players interact with The Order: 1886: QTEs. The game is larded up with button-pressing reflex tests, most of which result in an instant death if you miss. You'll think you're watching a cutscene, only to be interrupted by a button prompt, which you'll probably fail to catch in time. Galahad will die, and you'll reload, grudgingly picking up the controller and preparing to react better next time. The majority of the game's non-shooting interactions are QTEs, most of which are strangely designed even by video-game QTE standards. I would've rather just watched the cutscenes play out without my input, and given how dull I found most of the cutscenes to be, that's a grim prospect. You can also occasionally poke around a room or two, picking up objects in the environment and turning them over in Galahad's hand. Some of the things you'll pick up are newspapers and handbills that help flesh out the game's fictional universe, but most of them just feel odd and extraneous. 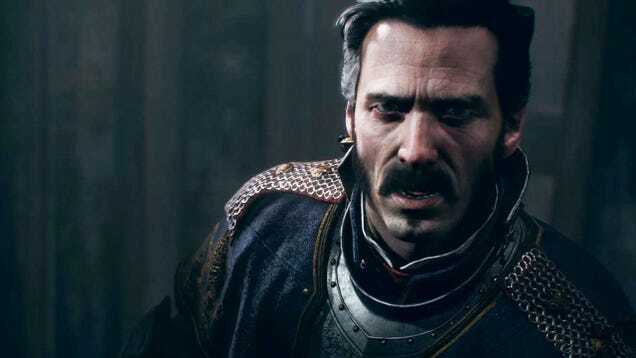 The Order: 1886 is billed as a film-like experience, a game that combines the magic of cinematic technique with the graphical prowess of the PS4. Unfortunately, it fails even as pure eye-candy. I was impressed by the visuals in a couple of sections in the game — a brief bit atop a flying airship, or a kitchen shootout that sends pots and pans nicking and popping about under a hail of bullets — but The Order is mostly drab and dark, drenched in rain and shadow. The fidelity may be high, but artistic vision is in short supply. Furthermore, the game's cinematic ambitions frequently undercut its functionality. The Order has been "movied up" with a film-grain effect, motion blur, and a pronounced depth-of-field effect, all of which can make it difficult to tell who is shooting at you, and from where. I'd often find myself aiming down my sights at a blurry grey blob, waiting for the game's "camera" to realise what I was pointing at and snap into focus. The blurriness and visual noise may well be a deliberate attempt to capture the chaos of a battlefield, but it winds up feeling like Galahad's eyes aren't focusing properly. The Order's cinematic aspect ratio puts black bars on the top and bottom of the screen, limiting the player's field of vision for no appreciable reason. I could at least understand why last autumn's horror game The Evil Within would use that effect, the better to ratchet up tension during the scary bits. But The Order is a cut-and-dried shooting game, and its limited field of view is mostly just frustrating. I don't mind cinematic effects in games, but The Order demonstrates many of the ways they can go wrong. And… [checks notes] … I guess that's pretty much it. By the game's final level, I was simply chuckling, incredulous. After the woeful final boss, The Order attempts to end on some sort of profound emotional note, then play off its bushel of unresolved plot threads as deliberate sequel-fodder. No sale. The Order: 1886 doesn't feel like the product of someone's grand vision; it feels like the tatters of that vision have been gathered, taped together, and presented as complete. The best I can say of it is that its premise is just novel enough to feel wasted. As I played, I kept wishing for some hint of inspiration, a dash of spirit to warm me against the chilly downpour of mediocrity. I found none.